This piece was created in response to our situation as New Orleans artists affected by Hurricane Katrina. We made “A.R.M.” kits are based on the M.R.E. (Meal, Ready-to-Eat) packs handed out by the National Guard to hurricane victims in the wake of Katrina. Jenny and I dressed as relief workers/national guardsmen, entered the gallery, and handed A.R.M.s to viewers. 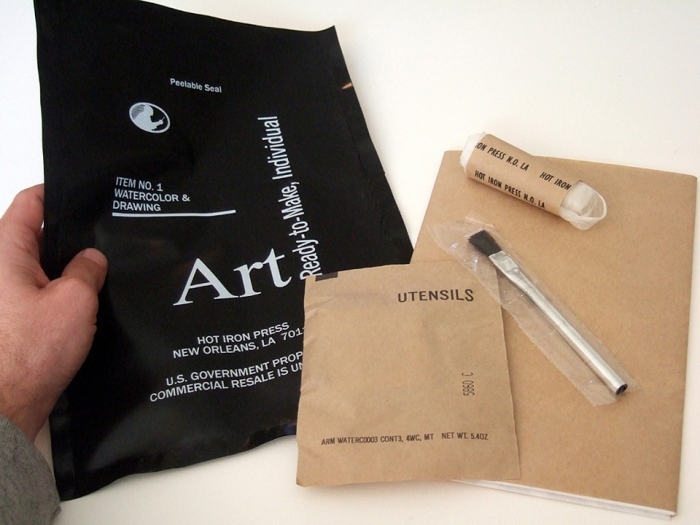 The viewers then opened the kits and followed the instructions inside to fill the gallery with artwork and packaging debris reminiscent of New Orleans pre- and post-Katrina.